Published: April 25, 2018 at 09:31 a.m. Updated: April 25, 2018 at 09:43 a.m. Here are my final top-50 rankings before the 2018 NFL Draft begins on Thursday (8 p.m. ET on NFL Network and FOX). There's always the possibility of a late surprise or two, but at this point, teams have all the important information on these players and their boards are locked in. Ragnow has been a very effective player at both center and right guard during his career at Arkansas. He has an excellent combination of size, quickness and toughness. In the run game, he has a quick first step. He operates out of a narrow base, but he's able to generate a lot of movement at the point of attack. He's an excellent finisher and he's also effective on outside pulls. In pass protection, he does a nice job of staying square and using his upper-body strength to torque and wrestle pass rushers. He lacks ideal knee bend, but he gets away with it against top-notch SEC competition. Overall, Ragnow has the necessary skill set to start early in his career and perform at a high level. 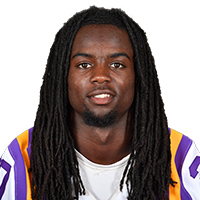 Falling out: LSU WR D.J. Chark (49); N.C. State DT B.J. Hill (50).